Cypress Semiconductor announced its Wi-Fi and Bluetooth combo solution delivers robust wireless connectivity to the new Raspberry Pi 3 Model B+ Internet of Things (IoT) single board computer. The Cypress CYW43455 single-chip combo provides high-performance 802.11ac Wi-Fi for faster Internet connections, advanced coexistence algorithms for simultaneous Bluetooth and Bluetooth Low Energy (BLE) operations such as audio and video streaming, and low-power BLE connections to smartphones, sensors and Bluetooth Mesh networks. The combo’s high-speed 802.11ac transmissions enable superior network performance, faster downloads and better range, as well as lower power consumption by quickly exploiting deep sleep modes. The Raspberry Pi 3 Model B+ board builds on the success of existing Raspberry Pi solutions using Cypress’ CYW43438 802.11n Wi-Fi and Bluetooth combo system-on-chip (SoC). to the new Raspberry Pi 3 Model B+. Wi-Fi networks powered by 802.11ac simultaneously deliver low-latency and high-speed with secure device communication, making it the ideal wireless technology for connecting products directly to the cloud. The Raspberry Pi 3 Model B+ board with the highly-integrated Cypress CYW43455 combo SoC allows developers to quickly prototype industrial IoT systems and smart home products that leverage the benefits of 802.11ac. More information on the Raspberry Pi 3 Model B+ board and ordering information is available at www.raspberrypi.org/products/raspberry-pi-3-model-b-plus, and more information on Cypress’ 802.11ac combo solutions is available at www.cypress.com/802.11ac. 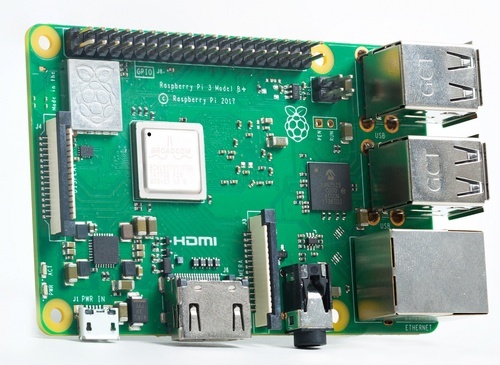 The Raspberry Pi 3 Model B+ board features a 64-bit, quad-core processor running at 1.4GHz, 1GB RAM, full size HDMI and 4 standard USB ports, Gigabit Ethernet over USB2, Power over Ethernet capability, CSI camera connector and a DSI display connector. The platform’s resources, together with its 802.11ac wireless LAN and Bluetooth/BLE wireless connectivity, provide a compact solution for the intelligent edge of connected devices. The Cypress CYW43455 SoC features a dual-band 2.4- and 5-GHz radio with 20-, 40- and 80-MHz channels with up to 433 Mbps performance. This fast 802.11ac throughput allows devices to get on and off of the network more quickly, preventing network congestion and prolonging battery life by letting devices spend more time in deep sleep modes. The SoC includes Linux open source Full Media Access Control (FMAC) driver support with enterprise and industrial features enabled, including security, roaming, voice and locationing. Cypress’ Linux FMAC driver can be found at https://community.cypress.com/docs/DOC-14597. Cypress’ CYW43455 SoC and other solutions support Bluetooth Mesh networks—low-cost, low-power mesh network of devices that can communicate with each other, and with smartphones, tablets and voice-controlled home assistants, via simple, secure and ubiquitous Bluetooth connectivity. Bluetooth Mesh enables battery-powered devices within the network to communicate with each other to easily provide coverage throughout even the largest homes, allowing a user to conveniently control all of the devices from the palm of their hand. The SoC is also supported in Cypress’ all-inclusive, turnkey Wireless Internet Connectivity for Embedded Devices (WICED®) software development kit (SDK), which streamlines the integration of wireless technologies for IoT developers.